Further to instructions from David and Lynda, I am starting this thread on their behalf. Have you seen Jonathan Spollen? 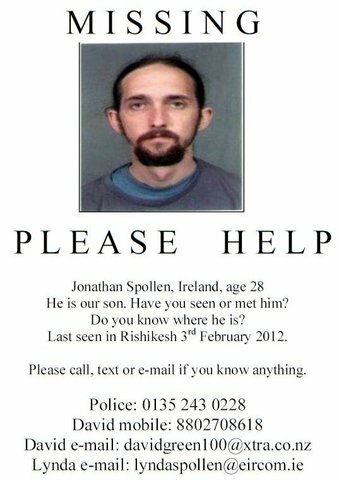 Missing in Rishikesh, India since February 3rd, 2012. Jonathan Spollen is 28 years old, from Ireland. 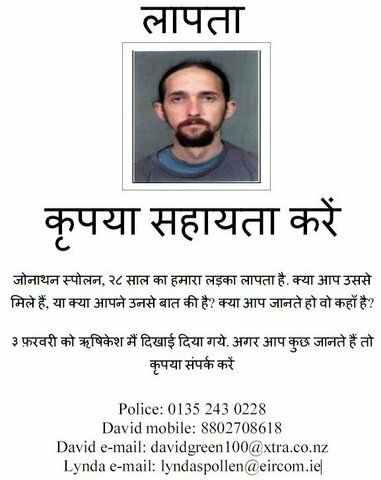 He was last seen in Rishakesh on February 3rd. He may have been planning to go on trek. If you have seen Jonathan or know where he is, please contact me or his Mum urgently. Please see attachment below for photograph. Thank you for your help. Please, all of you, keep in regular contact with your families. Even if they don't say it, they care for you and worry about you! Captain Mahajan received a Private Message from David, Jonathan's father, with the following message in it. David requested that we open a new thread in the appropriate forum. From David- except for salutations etc, this is the complete message. Sent approximately 3 hours ago. I met someone today who saw and spoke with Jonathan several times around the end of January, in Rishakesh. Jonathan was tall, thin, bearded and with long hair, looking quite pale. He had had a fall on his trek and had had to return early from the mountain. He also had a stomach bug. By the time he spoke to his Mum a couple of days later, he was in good spirits and was talking about going on a trek for a couple of weeks. He said, "Don't worry, Mum, it's kind of like a spiritual journey." I am thinking he would have been too weak to walk far, and he would have known that he needed rest. He is a logical thinker. He also looks for a story. I am hazarding a guess here, but Dharamshala would have interested him, because of the Dalai Lama, and because he may have decided at that point that he was going to make that spiritual journey. What I would like you to do is to attach this commentary to the current thread, and to open a new thread in the area where Dharmshala, with my original notice and with this attached to it. I would probably mess this up - hope you can figure out the best way of doing it. Edit Requesting the good folk here who have posted the notice elsewhere- on facebook, for eg, to update their information there. Some posts have been duplicated from the original thread concerning Jonathan's disappearance. They are still there in the Rishikesh thread. The Dalai Lama is due to give a public teaching in Dharamsala on 8th March. If I were a journalist with even the remotest interest in Buddhism, let alone a journalist who is seemingly renowned for writing about religious topics, I would not want to miss that opportunity. there is a vipassana centre just outside mcleodganj (near dharamshala). normally they conduct ten day retreats but it is possible to do one for longer. This is a copy of a post in the Rishikesh thread about Jonathan. Hi Everyone, this is Lynda, Jonathan's Mum. I hank you sincerely for your support and am amazed at your generosity of spirit. I know I must be practical now. As hard as it is to say, this has to be faced: If we accept that what Jonathan said to me was the truth, and there is absolutely no reason to doubt him as he is a very straightforward person, he set out on a 2 - 3 week trek. It is now 4 weeks later. He may have had an accident or fallen ill and be lying somewhere in need of rescue. I believe this has to be our primary focus. In this case every hour of every day is critical to his wellbeing. I believe where he stayed on the night of 2/2/2012 could give us the location of the trek he did. Had he travelled a distance to a totally new area such as Kashmir / Dharmasala etc. He would have told me enthusiastically. I think he travelled to the starting point of the 2 -3 week trek within the region Rishikesh to get an early start the next day - he turned his phone off directly after our call which would fit with this. If it was somewhere that he had been talking about and writing about he would have told me that he had made it there or returned or whatever - he is just open like that. I pray that he is indeed safe in an Ashram. I do feel that he could very well have changed his mind en route so identifying Ashrams in serene, spiritual, locations must still be very high on our list and can hopefully be de done alongside the trek search. Learning to meditate is something he is trying to achieve and indeed pass on to me. I didn't intend to say so much so thank you for bearing with me - those of you who did! However, your son being an international journalist, and his visa expired? I would indeed expect him to know better than that. Anyway and again: I'm sure you guys know him and arrived at your conclusions, not us. I obviously do not mean to worry you, any more than you'll already be. Hi Lynda, You've provided some very important information. I'm not a spiritual seeker ... but many members here are & could well decipher further from your post. Stay tuned to this thread as members login & post their thoughts & questions. Any other tidbit of information that you can recall Jonathon relating to you may help in determining his direction taken. Absolutely. Or if indeed, he went for a vipassana or such retreat. "He turned his phone off directly after our call" does not compute, because he would have got phone signals for at least a few hours thereafter if he was talking from Rishikesh. Was he talking from Rishikesh or was there just a sense that he was? It appears that he has not gone in for long vipassana without letting folks know at home, because he is not the type. Unless he 'ran into' an ashram during the trek and there was no phone signal. 'trek in this beautiful place' - if verbatim, implies Garhwal and not even Kumaon. All contact details are in the first post of that thread. Yes, I would agree, Capt. There was one additional article on his Kashmir trek(April 2010). He talks about definitely returning to Kashmir some day, but never again in Wintertime, so my guess would be that this would rule the more northerly destinations/treks out. Two thoughts. It's quite possible that he still had Dharamsala on his mind after having missed it on the previous trip. We all know what it's like to fill a void & get a place crossed off of our mental todo lists. And Dharamsala appears to have a particularly strong attraction for travelers. The other thought was that his stories from his archive were all of a Muslim/Islamic interest and he is very, very good on these topics. This could be significant & maybe a literary trend that he hoped to continue on this trip. Or since he does not appear to have written for that Newspaper(thenational.ae) since the Kashmir article - my question would then be, has he started a partnership with any newspapers? If so, has he received any new specific assignments that may narrow down the search at all? Perhaps something was mentioned in an email or text to his family, close friends &/or colleagues. Glad this one didn't slip under the radar. How far is Dharamsala from Laxman Jhula? Glad this one didn't slip under the radar. How far is dharmsala from Laxman Jhula? According to the article I linked previously, Dharamsala was where he desired to go on his first trip to India. He never made it after having run into the Kashmiri Connaught Place touts - who apparently 'persuaded' him into visiting Kashmir instead. It's possible he may have wanted to fill that void somehow. Just a theory, as good as any at this point & nothing to be at all skeptical about really. I have moved a number of posts into this new thread, by copying and pasting them. Please let us know if you have any changes. I am now closing this thread, since it will become highly confusing! What does this mean ?? ?